America’s middle class has money to spend. More than seven years after it began, middle class households are starting to feel the recovery. 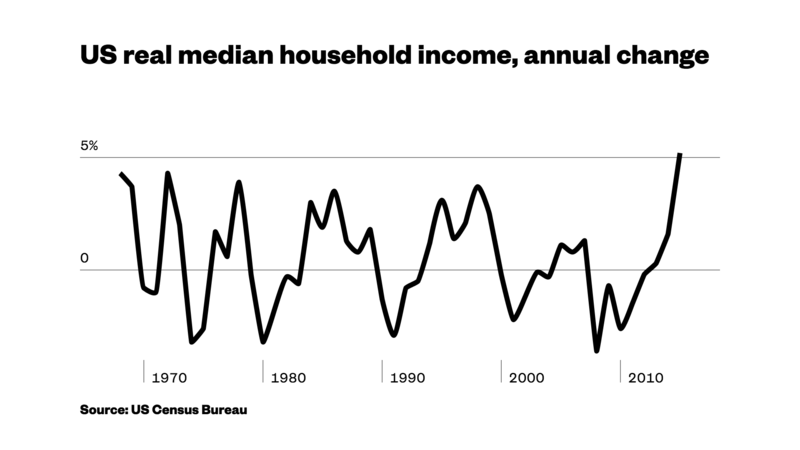 US median household income rose 5.2 percent last year, the fastest one-year increase in records that stretch back to the late 1960s. It was the first increase since 2007. And the rise brought the level of median income—the point at which half American households make more and half make less—to $56,516. The last time they were higher was before the recessions in 2007, when it reached $57,423. Median household income—which includes a range of cash received by households such as paychecks, dividends, rents, profits, alimony, child support as well as cash government benefits like social security, disability, workers compensation and unemployment benefits—is a widely watched statistical measure of how a “typical” American household is doing. Consistent American job growth helped drive the improvement. The US economy has created jobs for 71 straight months through August, the longest streak on record. The unemployment rate has fallen from a peak of 10 percent in October 2009 to 4.9 percent in August. Still, through much of the recovery that job growth was concentrated in either high-skill professional sectors, and low-pay industries such as leisure and hospitality jobs. As a result, the benefits of the recovery have been slow to reach the middle class. Since hitting a pre-recession peak of in 2007, median household income declined sharply and then stagnated. Even with last year’s strong bounce, it remains 1.6 percent below the 2007 level.They also remain below the all-time peak of $57,909 set back in 1999. As with any statistics, there are problems with median household income. For one thing, the structure of a “typical” American household changes over time. Today’s American households are older and include more families headed by single parents than they did in say, 1975. That means that we’re not exactly comparing apples to apples over time. But the stagnation long seen in the median household income numbers is consistent with the broader story of the hollowing out of the once-mighty American middle class over the last 30 some-odd years, that has left the US an increasingly unequal society. A recent report from consulting firm McKinsey recently said roughly 80 percent of American households haven’t had a raise over the nine years between 2005 and 2014. The Pew Research Center found last year that the country is at a tipping point where the middle class population may soon fall to less than 50 percent of the US adult population. All that said, if the US is ever going to repair the damage to US middle class incomes have to start rising. The increase seen in 2015 was very good start.